Pinball - Do you like your video games to be a little less virtual? 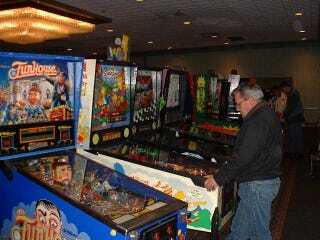 Then you might want to check out the 2011 Pinball Expo which kicks off in Chicago this week. Make sure to grind a machine for me if you go! Virgin Media was told it can no longer run broadband ads claiming that their UK internet service is the best for online gaming. Counter-Strike: Global Offensive had its first official tournament over the weekend at the New York Comic-Con. Some of the fun of playing Dark Souls, and Demon's Souls before it, is the spectacle of the game and the sheer confusion you might feel when you first drop into the unforgiving world created by From Software. Want to know how reader Liatte–-a lawyer and aspiring Lego artist-made her room of necessity themed around Nintendo's iconic plumber? She's been kind enough to answer a few questions about her Mario tribute bathroom and how she got it that way.